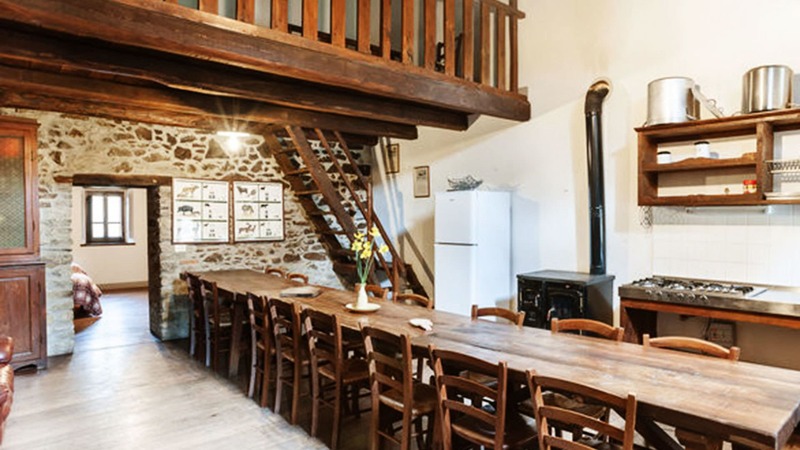 La Conca is a large working organic farm with a range of holiday accommodation. It covers approximately 300 hectares (741 acres) of woods and pastures, inhabited by fallow deer, moufflons, roe deer, all in their natural states. The guest accommodation is in ancient casali, the Tuscan farm-houses, built of stone and carefully restored, furnished with rustic furniture, with open fires, a large tavern and a small private church. 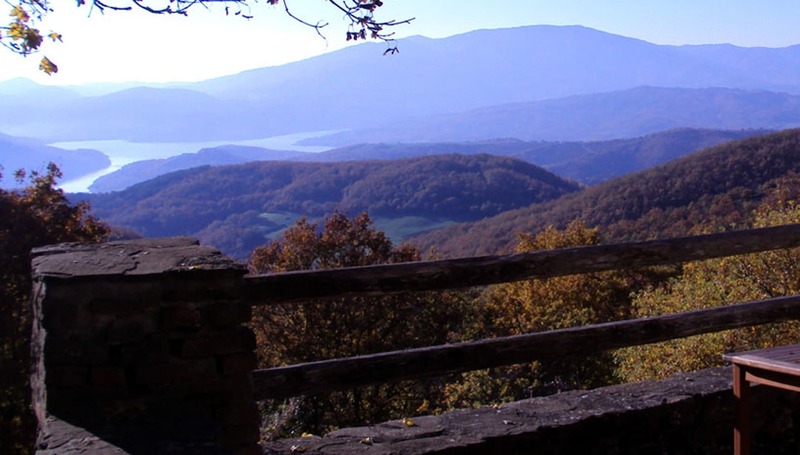 Guests are free to enjoy the large private natural park, the swimming pool and activities including horse riding, archery, bocce (a traditional Italian game similar to bowling), guided rambles on foot, horseback or on mountain bikes, nature watching and photography from observation posts, and gathering mushrooms, chestnuts and fruits of the forest. The farm is made up of four ancient poderi (farms owned by the farmer) which between them cover a vast area of hill and mountain ranging, in height, from about 400 metres (1312 feet) to 1000 metres (3280 feet) above sea level, and covering about 300 hectares (741 acres). 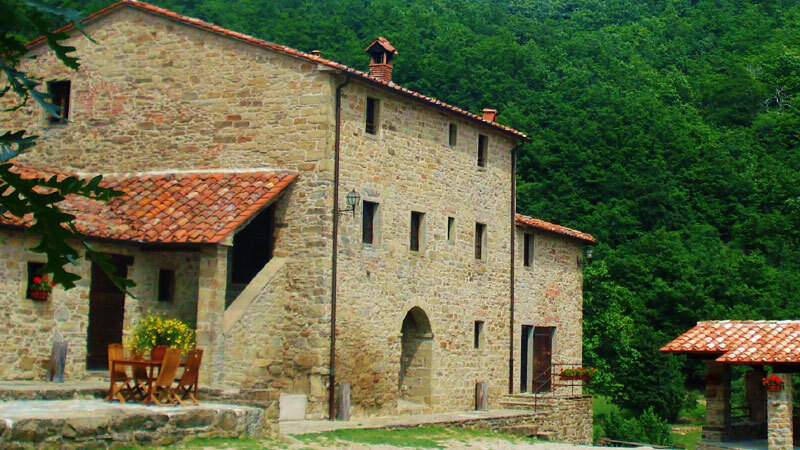 The casolari- traditional Tuscan farm-houses- were built around 1500AD, and there are firm historical records of this. 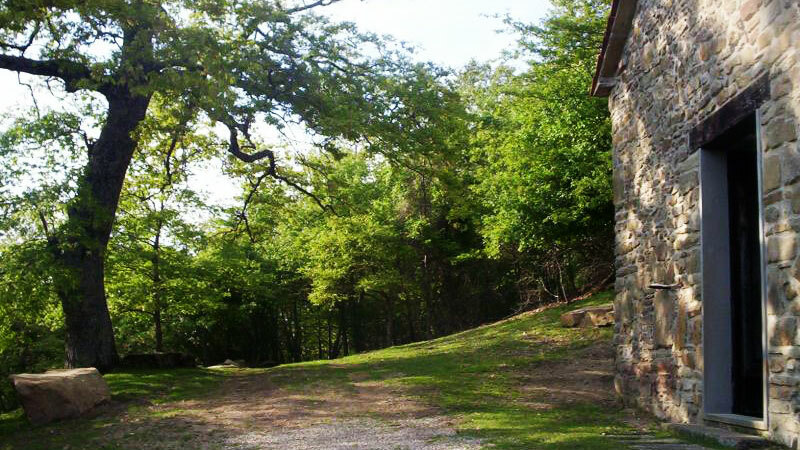 “Santarsa“, specifically, was originally an ancient military watch tower, which later evolved into a farm house. A number of remarkable architectural features have been preserved, and are still present today. It takes a dominant position overlooking the whole Tiber Valley. “Vallorsaia“, on the other hand, was originally built as a farm, belonging to the Monastery of the Nuns of Aquitrina, which has now completely disappeared. The four poderi (farms) of ancient origin (La Conca, Santarsa, Vallorsaia and Il Cungi) are typical examples of traditional farming in hill areas. They are characterised by their layout which entails a very low environmental impact: small fields, often terraced or closed off, are distributed across large wooded areas. The place name Vallorsaia probably derives from its position in a heavily wooded area, rich with game. The two small chapels, one at Santarsa and one at Il Cungi stand witness to the strong Franciscan influences in this region. As agriculture and industry became more and more mechanised, starting in the fifties, the land was abandoned. Whilst the abandoning of the poderi created a state of decay in both the buildings and the farmland, it also preserved the original architecture intact, both in the buildings meant for living in and the agricultural ones. Since 1980 we have been working towards the rescue and rebirth of the farm. We have been conserving and restoring both the buildings and the environment they are part of, in order to preserve and display the historical wealth of these ancient living places and the rare wealth of biological diversity presented by the small cultivated fields spread out, like a mosaic, through the woods. Today the rural farmhouses built of stone, wood and terracotta, lovingly restored, and equipped with all mod cons allow us to offer our guests an exclusive holiday in an environment of rare beauty only 5km away from the historical centre of Sansepolcro. A new way of experiencing agriculture has been born from our fervent search for a contemporary balance between the need to respect the natural world and the need to live off the land.New theories about preserving natural resources are merged seamlessly with a return to traditional farming techniques. The farm’s principal activity is breeding fallow deer, roe deer, moufflons all in their natural states. 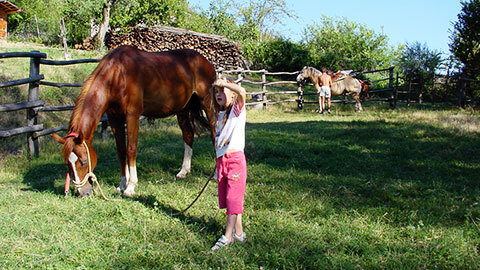 Other traditional agricultural activities practiced on the farm are forestry, the production of fodder for the game and horses, and the organic production of cereals, olives, fruit and vegetables for the use of the family and the guests. The wood from our forests is processed in our own saw-mill. 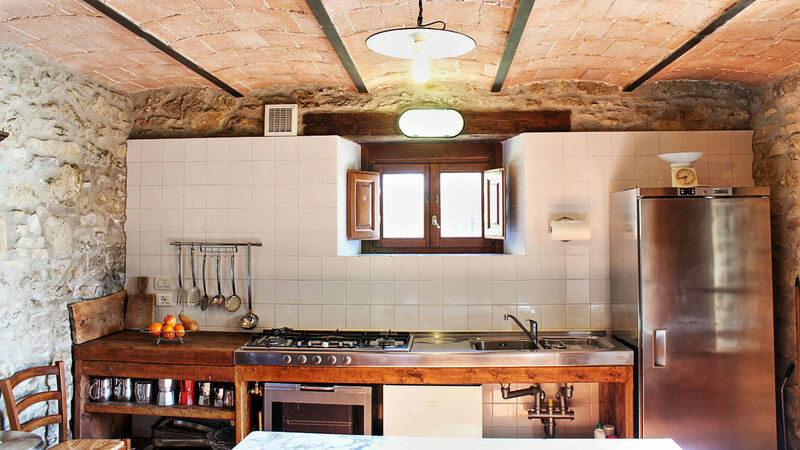 Opening the farm to guests fits perfectly within La Conca’s range of activities. Thanks to our guests the work of our farm is highly valued, and city-dwellers are able to gain first-hand experience of an active farm.